Zanskar Valley by Public Transport – How to Plan a Trip? When I get asked about the best mode of travel for a place like Zanskar, my answer always is a self-owned vehicle. If not then the next best option would be a private taxi. Both these options however are not always a choice for everyone; and a lot of people try to make their trip by public transport. In case of Zanskar Valley, public transport would mean traveling by local buses and shared taxis. It may not be an easy affair and is surely not the most convenient one; but is definitely doable. Zanskar is still one of the most remote regions of our country but there is a regular bus service that connects it with rest of the country. How you can travel to Zanskar by Public Transport is what we will be talking about in this article. There are two ways that a trip to Zanskar can be made. The first and the more common one is to incorporate it with an existing trip to Ladakh by adding a couple of days more to the overall itinerary. If that is what you intended to do than there is a Bus that plies from Leh to Padum via Kargil that you can use. Or you can first board a Bus or shared taxi from Leh to Kargil and then another one from Kargil to Taxi. 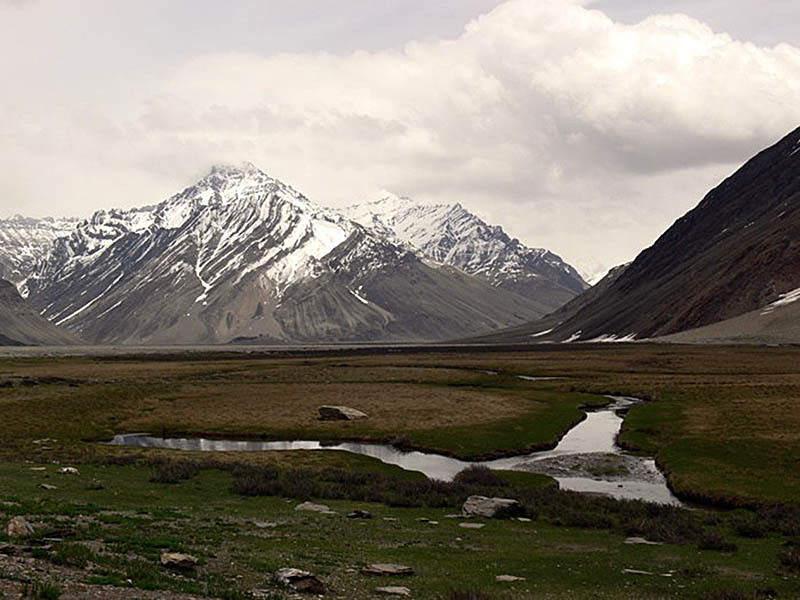 The second way to visit Zanskar is to only visit Zanskar. And by that, I mean to keep Ladakh out completely. A third question that arises then is of how much it will cost overall. The article below talks about all these three aspects in detail and by the end, you will hopefully have enough information to plan and execute your trip successfully. Defining the cost factor of a trip is really not an exact science because it depends entirely on a person’s personal spending habits. There are too many variables due to which, no one can tell you exactly how much a trip will cost. With that being said, a minimum estimate can however still be given. There are a few costs that will remain the same on the minimum side of the budget. So when I talk about the expenses incurred further in the article, I am really talking about the minimum budget that you would need to visit Zanskar. And considering the fact that we are talking about traveling by public transport here, I am assuming that you are in fact interested in knowing the minimum budget only. For more details on how much a trip to Zanskar can cost you, I would recommend that you read Cost of Zanskar Valley Trip – How to Plan your Budget. If you went traveling by your own vehicle or a private taxi, then without any doubt, that will become your greatest expense. Traveling by your own vehicle, the total money you will spend on fuel will be equal to that of the total of all your other expenses. On the other hand, if you rented a private cab for the journey, the kind of money you will spend for a taxi will be far greater than all your other expenses. This cost however reduces significantly if you chose shared taxis or buses to be your preferred mode of commute. Cost of hotels and meals then would be your greatest expense which luckily, is still not that high in Zanskar. In order to explain it better, I will first suggest an example of an itinerary that you can use to travel to Zanskar; and then run down that itinerary detailing how you can travel and how much it will cost. For the sake of this article, I will assume that you are starting from Delhi. If you were however coming from a different city, then only the details for first and last day of travel will be different; rest of the details will still apply. This itinerary is the minimum time that I will recommend for visiting Zanskar. Any lesser than this and you will have to either give up the idea and plan for a later duration. Or you can save a couple of days by booking a flight in and out of Srinagar. If you do that, you will save 2 days in the above mentioned plan and will wrap up the journey in 7 days. There are several buses plying between Delhi and Jammu that you can travel with. Starting fare of the bus is around Rs. 600 per person. You can either look for a Bus online and book it or you can try to find one from ISBT Delhi. Or an even better way to travel would be to board a train from Delhi to Jammu, starting fare of which would be around Rs. 300 – 400. There are several budget hotels and guest houses in Jammu that are quite close to the Bus stand and will cost you about Rs. 800 per room for a day. For this day’s journey, I will recommend that you travel by either a Bus or shared cab. There is a train station at Srinagar but the problem is that it is not yet fully operational and connected. At the time of writing this article, it will take at least another 18 months to 2 years for a full connectivity. Right now, you can reach till Udhampur by train. From Udhampur, you will then have to board a bus or taxi for Ramban. After reaching Ramban, you will then board another train from Ramban to Srinagar. An easier way thus would be to just board a bus or shared taxi directly from Jammu for Srinagar which you can get Jammu Bus stand . J&K State Road Transport Corporation (JKSRTC) operates fairly comfortable buses from Jammu costing around Rs 350 per person. This bus completes the journey in about 11 hours. There are also direct buses from Delhi taking almost 24 hr to reach Srinagar. If you would rather board a shared cab then you can find that from the taxi stand near Gumat Bazar. A shared taxi would cost about Rs. 800 to 1000 per person. Once you arrive in Srinagar, you can stay at a houseboat in Dal or Nigeen Lake but that will be a bit on the expensive side. If you are traveling on a budget then look for a hotel which you can easily get for Rs. 800 to 100 per room for a day. There are plenty of travel options to commute from Srinagar to Kargil. You can either just go to the Bus stand and board the morning Bus which will cost you about Rs. 400. This is in fact the same bus that goes all the way to Leh the next day with a night halt at Kargil. If not the bus, you can easily find a shared cab for Kargil from either Tourist reception center or the Taxi stand near Nehru Park. A shared cab will cost about Rs. 800 per person. Accommodation in Kargil can be a bit on the expensive side and I will recommend that you keep at least Rs. 1000 to 1200 as budget for your stay here. There is a weekly Bus from Leh to Padum via Kargil which you can board for this day’s journey. Bus this is a weekly bus and it is rare that your travel dates will match its timings. Hence it would be better to strictly rely on shared cabs that the locals use. If you were lucky then you may find a direct cab for all the way to Padum. If not then you will have to break this day’s journey in several parts. You can just keep changing cabs at Kargil, Parkachik, Panikhar, Sankoo and Rangdum until you get to Padum. This may sound a bit hectic to do but is not too difficult really. Locals on this route commute on regular basis and finding a shared cab won’t be too tough. If you were able to board the Bus then fare per person would be about Rs. 400. If you however went by shared cab then you may end up spending anywhere between Rs. 1000 to Rs. 1500 per person. Average cost of accommodation in Padum will come out to be around Rs. 800 per room for a day. There is no public transport available within Zanskar valley. There are no buses available and the villagers depend entirely on shared Sumo cabs but their frequency is not that great. As a tourist, it is nearly impossible for you to depend on local transport for sightseeing purpose; which then pretty much limits your option to a private taxi. Depending on the places you want to cover on this day, a private cab for an entire day will easily cost you anywhere between Rs. 6000 to Rs. 1000. This will also heavily depend on your negotiation skills. To rent a private cab, just talk to the owner of the hotel you were staying at and they will arrange it for you. You will travel the same way that you did to reach Padum. If you were able to find a bus from Padum to Kargil, then board it. If not, you will again be depending on shared taxis which can either be one cab all the way; or multiple that you will need to change on the way. You will reach Kargil by evening and stay there for the night. There are several buses and shared taxis plying between Kargil and Srinagar. These are a mix of both the transport from Kargil itself; or any other bus or cab traveling from Leh to Srinagar. Either ways, a Bus will cost you about Rs. 400 to Rs. 500 and a shared taxi will cost about Rs. 800 to 1000. There are several buses that ply from Srinagar to Jammu on a daily basis that you can board for this day. Or you can just reach TRC near Dal Gate or Taxi Stand at Nehru Park and board a shared cab to reach Jammu. For your final day of the trip, you can either board a bus for Delhi from Jammu Bus stand; or you can board a train if you have booked your tickets in advance. Now the itinerary above explained the journey for someone traveling to Zanskar valley. Majority of the people however tend to incorporate Zanskar with their trip to Leh which can easily be done by adding 4 to 5 days in the overall itinerary. If you too were planning for the same then you have two choices. The first one is the weekly bus from Leh to Padum. This bus completes the journey in 2 days with a night halt at Kargil. It reaches Padum in a total of 2 days and then travels back to Leh on Day 3 and 4. If the dates of your travel matched the timings of this bus then this will be the most cost effective way of the journey. Problem however is that the frequency of the bus above is way too less and chances are that you will find it almost impossible to plan accordingly. The next choice then is to break your journey in 2 parts. From Leh, you will then have to reach Kargil first for which you will find plenty of shared cabs and a daily Bus. The travel cost per person from Leh to Kargil will come out to be about Rs. 400 – Rs. 500. From Kargil, you will then travel to Padum the way I explained above in the article. Another way to do this journey would be to include Zanskar while going to Srinagar. You will reach Kargil from Leh and then travel to Padum from there. For your return journey, rather than going back to Leh, you can continue towards Srinagar from Kargil and catch a flight home from there. If you were short on time; or wanted to spend more time sightseeing in Zanskar valley; then a better way to plan would be to catch a flight directly to Srinagar; and then fly out of there. This will thus save you at least 2 days of road journey to Srinagar; time which you can spend in Padum or at any other place exploring more tourist destinations. I hope the information above on traveling to Zanskar Valley by Public Transport was of help. If you have any other questions; or need any further details; please feel free to ask in the comments section below; or at our Community Forum; and I will be glad to answer.